One of the things that makes our homestead unique is the fact that we don’t use conventional growing methods. Everything up to this point has been done by hand. First, we aren’t independently wealthy and my husband works a “day job”. We would love to turn this place into a full-time business, but realistically, that’s not in the cards in the near future. For now, it’s a hobby/”side hustle.” And that’s okay! Homesteady podcast referenced this statistic in episode 22; something like 91% of “full-time” farmers today have to depend on supplemental, off-farm income to meet their daily needs. Now, I don’t know how many of them are living beyond their means. I also don’t know what percentage of them are using subsidies, depending upon government assistance, have huge loans or anything else that may affect productivity or limit, restrict, or otherwise regulate their farming practices. What I do know according to a recent article is that an increasing number of agricultural workers are dying by suicide and suffering from depression and citing financial instability as the root cause. We didn’t choose to farm to get rich. The sad truth is that growing your own food (specifically meat and dairy) is becoming more expensive than buying it at the grocery store. In order for us to profitably raise pastured meat chickens in the Joel Salatin model, have the birds processed and packaged for sale at an approved USDA facility, we would be forced to sell them for more than $5…per pound! For a 5-6lb bird, that comes out to around $25-30 for a single chicken. I can buy an organic whole chicken at the grocery store for less than $9. See the dilemma? We’ve toyed with the idea of raising meat birds purely for our own consumption, but in order to be profitable, we’d have to do it on an enormous scale, and we just can’t compete with “big chicken” industry. Homesteading is hard. Ask my husband! He hand dug a 50 yard long swale last year in a single weekend! 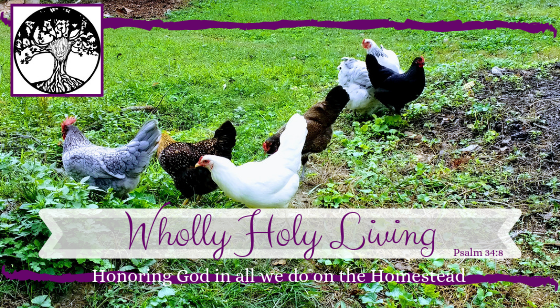 But when we decided to homestead it wasn’t just for a single reason; it was for health, financial stability, recreation, family values, faith, sustainability, anti-consumerism, and more. We wanted to know what was going into our food. We wanted to eat quality whole foods. We wanted to save money on groceries. We wanted to spend more time as a family and have my husband home more often. We wanted to depend less on consumerism and be more sustainable in our way of life. We wanted an environment in which our kids can grow and learn the direct benefit of hard work, patience, perseverance, and faith- anyone who’s ever planted a seed has learned those lessons. It’s a simple life, but it certainly isn’t an easy life. It’s hard. But, the hard is what makes it great. I love this. We are similar to you, we both work full time jobs, as well as having started this new hobby, in hopes it can grow and grow until we no longer need to work “real” jobs, but instead work, probably 10x harder, but just at home. We started a garden this year, have chickens, ducks, rabbits, and a ridiculous amount of plans. Anywho, I completely agree with this article, it’s hard but worth it. Absolutely! I’ll pray God blesses your efforts and makes you fruitful! That which is not difficult is not worth doing, no lesson can be gained without a little bit of pain. I grew up on a farm before moving to the city in my early teens. Last year my wife and I bought a patch of heaven and began this journey for ourselves….and it is truly as you say. The beauty is in the hard.